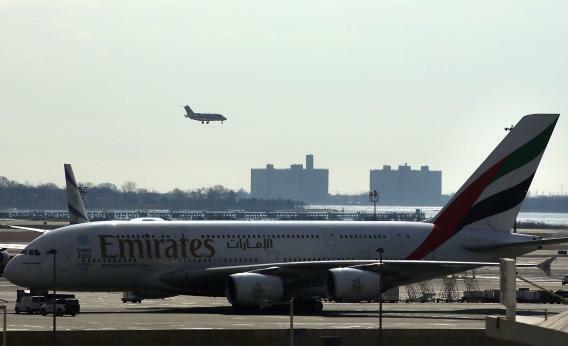 FBI investigating pilot report of drone sighting by JFK Airport. Pilot Reports Drone Sighting by JFK Airport. Get Used to It. From Amazon’s toy store to North Dakota, drones sure do get around. Now, a pilot claims he saw an unmanned aircraft hovering dangerously close to a passenger jet above New York—prompting safety fears as well as an FBI investigation. According to FAA regulations, small drones can be flown without approval only if they are kept below 400 feet above ground level, flown a sufficient distance from populated areas and full scale aircraft, and are not for business purposes. But it’s unclear how rigidly this is enforced. The FBI says the unidentified New York aircraft, described as black in color and no more than three feet wide with four propellers, came dangerously close to the Alitalia plane—within 200 feet. While the word drone conjures up images of large military-style Predators or Reapers, in this case the aircraft seems to have been more in line with a radio-controlled plane used for recreational purposes. A similar incident was reported to have occurred in Denver last year, when a “mystery object” suspected of being a model aircraft nearly caused a collision at some 8,000 feet. Incidentally, large military Reaper drones are being tested from an air base in Syracuse, N.Y., but these would not be permitted near JFK or in the vicinity of passenger jets because of ongoing safety issues. A collision between a military drone and a cargo plane in Afghanistan in 2011 illustrated that there is still some way to go before the controversial aircraft will be fully integrated into U.S. airspace. Predators and Reapers are currently used domestically only in isolated areas away from manned aircraft, such as near border zones in Arizona and Texas. The FAA has a September 2015 deadline to open up U.S. skies to commercial and civil drones. However, as drone technology becomes more affordable for private citizens to purchase, it follows that the risks will heighten, as the incidents in New York and Denver perhaps demonstrate. A recent Congressional Research Service report warned legislators about various “drone crimes” that could be committed as the aircraft become more pervasive. “As drones are further introduced into the national airspace, courts will have to work this new form of technology into their jurisprudence,” it noted.